Temporary email addresses: Sign up and get verified on websites/apps without giving away your primary email | Best disposable email websites | TechNarcs '+g+"
Have you ever tried to access some random website/app but they required you to sign up or at least provide your email to view their content or use their services, and that's something you aren't comfortable with since you didn't plan on using the website regularly or perhaps it didn't seem to be secure enough to trust it with your main email and other credentials or maybe it's one of those websites that love to spam your mailbox. So what do you do? use a fake wrong email address? now that won't always work since most websites either require you to to verify the email address by sending it a verification code which you need to confirm, or the information you seek itself is sent to the email address. And so enters the role of temporary email addresses. A temporary or disposable email address is a fully functional random email address that is usually provided to the user without any need for signing up or giving any private details to the temp email provider. This email address is temporary, ie. it usually expires after a small time period, but that's all we need for getting the verification code or whatever else we require from it so it's pretty convenient. Also, you can get as many temp email addresses as you want. The process of getting and using a temporary email address is very simple and straightforward. You can get a temporary email address from a number of temporary email providers, in most cases you won't need to give them any personal info and you can start using the email right away. But I'll still show you how to use a couple of these sites, coz why not. 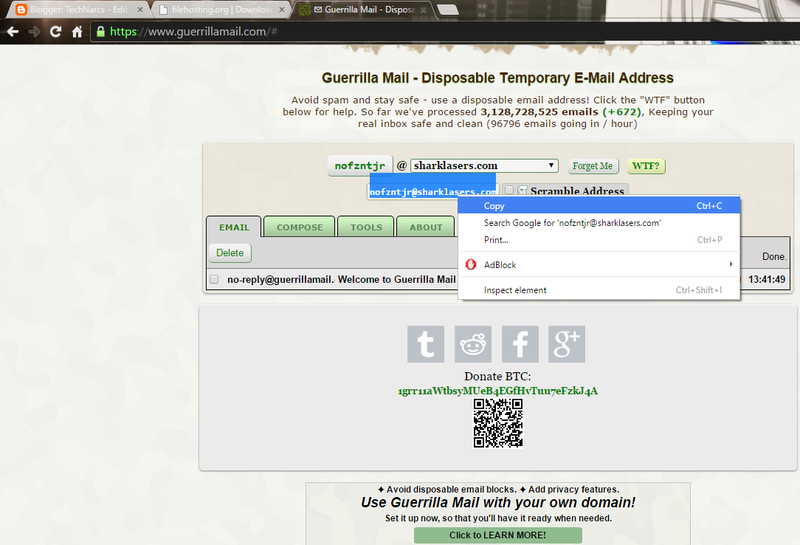 Some of the best free temporary email providers are Guerrilla mail, Mailinator, Temp mail, and Yopmail. note: Some websites don't accept temporary emails from yopmail, while some don't accept email addresses from mailinator and others, so if one of the above providers' temporary email addresses don't get accepted for you, just try using a temp email address from another provider. Visit the website you want to use that requires an email. 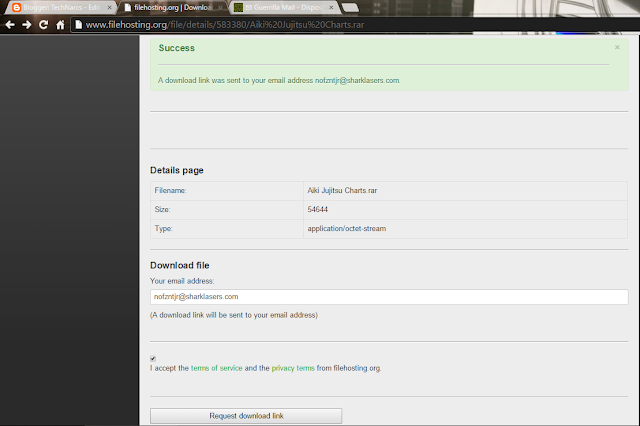 In this example we want to download this random file from filehosting.org but they require an email address where the download link will be sent. Now instead of typing our original email address, we will use Guerilla mail's services. 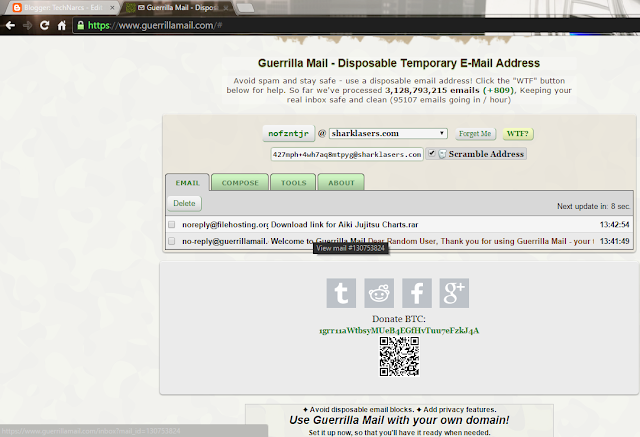 To do that, open www.guerillamail.com in a new tab, you should see a randomly generated email address along with an inbox there, uncheck "scramble address" and copy the email address. Use the email address for whatever purpose it was required and request an email. As you can see in the screenshot below, the download link has been successfully sent to the email address. Finally, go back to the guerilla mail tab and you should find the email from your target website in your inbox(refer screenshot). Wasn't that simple as hell? Yep it was. Now remember don't misuse these services and I am not responsible if you get in any trouble for this, as using temporary email addresses may be against some websites'/apps' policies. Also don't use this for registering on websites/apps that you plan on using regularly because these email addresses are insecure and go void in a small time period so they aren't exactly the ideal "recovery email addresses".